With a plethora of building going on in the region, Canterbury has become a bastion of contemporary architecture – so much so, that a home we featured earlier in the year won the prestigious nationwide Registered Master Builder House of the Year competition. This exceptional home designed and built by Metzger Builders scooped the Supreme New Build of the Year grand award, as well as the New Home over $2million award, so of course, it had to be our winner too! You can’t go past the workmanship, wow factor and attention to detail in this rural gem. We’ve selected our homes under the four categories of Best New Build, Best Inner-city Dwelling, Best Renovation, Best Show Home and of course our overall winner. We hope you’ll enjoy taking another look at these rather special projects. This abundant rural sanctuary by Metzger Builders takes our top spot as the Supreme Winner of Abode's Best of the Best. Throughout 2018, the Abode team worked with homeowners and builders to showcase a range of truly exceptional homes from around our region. Each and every one of our featured homes has been of an exceptional standard and that made picking our five favourites very tough. When it came to awarding our Best of the Best top spot, however, there was one true standout. Metzger Builders’ grand new build from our Sep/Oct issue, resplendent in its rural setting, has recently been awarded the title of Supreme House of the Year at the prestigious national Registered Master Builders House of the Year awards, and we couldn’t agree more. There’s a whole lot to love in this sprawling six-bedroom, contemporary, modern home featuring an over-height central living area; full height, oversized interior dividing doors to increase the volume of space; a soundproofed movie room; fully automated lighting, heating and audio/visual systems; generous storage areas; and a strong connection to the outdoors with all living rooms and bedrooms opening to the private garden or the upper deck. The spacious kitchen is the heart of the home. Soaked in natural sunlight, the space is generous, family-friendly and functional. An extended bench with a waterfall end works as a dining area, homework area and general everyday work space. Beyond the kitchen there is an informal lounge area and a sumptuous dining room enclosed by glass. What can we say, we absolutely love it. From the movie room to the water feature under the stairs, this is somewhere we’d all love to come home to – a spectacular abode indeed and a shining testament to everyone involved. We were thrilled to see our region represented at this level and to see Metzger Builders recognised for their work on this outstanding project. Congratulations! Spectacular views, superb craftsmanship and sustainable materials are the hallmarks of this stunner from Avenue Homes, winner of our Best New Build category. 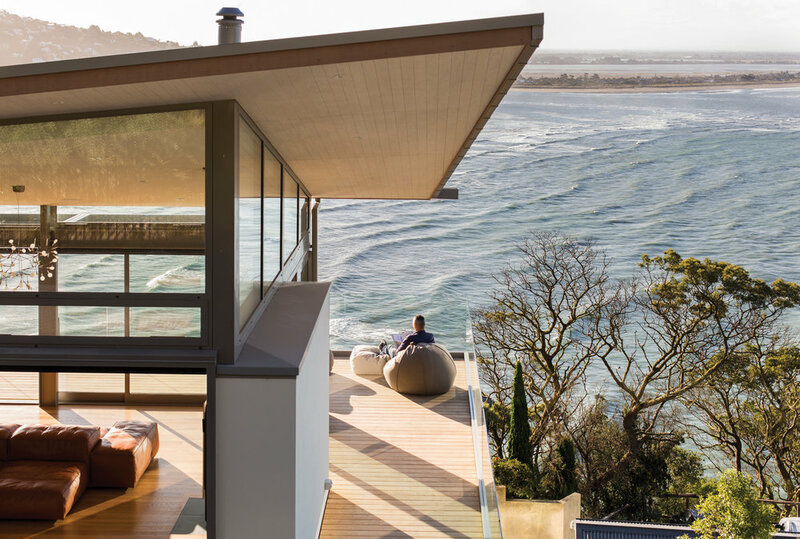 The question is, what’s not to like about this relaxed and sun-soaked home, positioned to perfection to look out on the changeable panoramic view of the coastline, stretched out as far as the eye can see. This triumph of design and engineering paired with Avenue Homes’ craftmanship, prompted some serious home envy among the Abode team. The client wanted a cosy home that made the most of the view and had enough room for guests to stay. A simple brief, and indeed, the finished home has a simplicity to it – a chilled bach-like feel that belies the technical challenges involved and the level of thought, care and expertise that the Avenues team threw into the build process. One of the reasons we chose this project was the effort made to build a home that treads lightly on the environment. Solar panels, rainwater retention tanks, automated overhead louvres, an ultra-low emission log burner, high-level windows, sliding screens, low-maintenance materials and the warped roof, designed to follow the daily sun path, were all included. Modest in its footprint, the upper level of the home comprises an open-plan kitchen, dining and lounge area, a snug, small study and a toilet. Three bedrooms including master with ensuite, as well as a further bathroom and separate toilet, laundry and sauna are on the middle level, while a double garage with storage is in the basement. Generous decks connect the house with the pool, an outdoor shower, vegetable garden, and a grandstand-like seating area. There’s so much we love about this home from the way it’s tucked into the hillside almost as if part of it, to the curve of the roofline, the seamless flow from indoors to the outdoor living and the care and attention paid to the smallest details. The quality of the workmanship from Avenue Homes has delivered a flawless finish throughout this beautiful, serene space. Bravo. KI Commercial's total transformation of this elegant Merivale townhouse is the worthy winner of our Best Renovation. In the Abode office we love a good makeover – there’s nothing like a before and after to inspire us all. And, in the case of our Best Renovation winner, completed by the team from KI Commercial, the result is so well executed that many mistake the stunning home for a new build. The project was an extensive renovation of a four bedroom townhouse in the heart of Merivale. 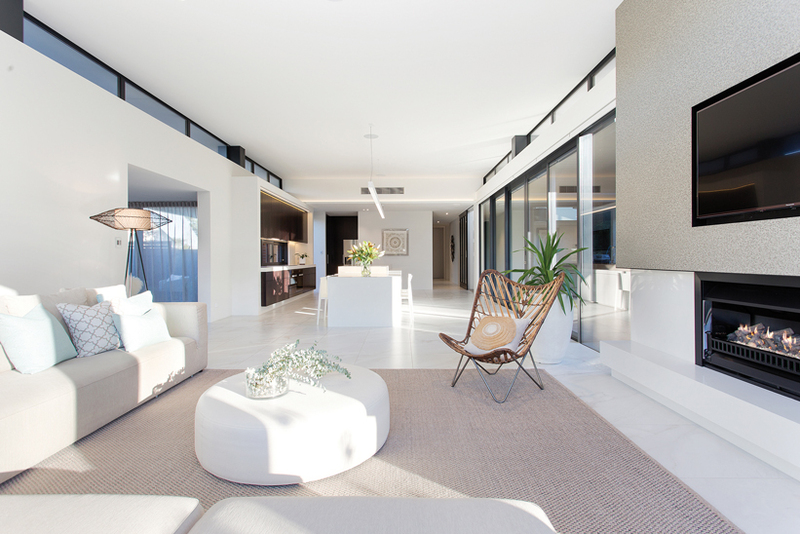 The result is a light-filled and expansive home with plentiful helpings of luxury. Leading the project and asking for meticulous attention to detail, project manager for KI Commercial, Paul Keung and his team put absolutely everything into creating a home that showcases the best of design, materials and workmanship. Just some of the many highlights include a feature fireplace and glass balustrade that opens up the stairway and pours light into the house. Upstairs, there are redesigned bathrooms and a new custom-built office and kitchenette complete with wine bar off the master bedroom. The home’s pièce de résistance is undoubtedly the kitchen that features two benchtops; one uses a solid slab of American oak, while the other an exquisite Brazilian granite. Paul says the house was the first in New Zealand to use this particular granite, which also makes an appearance in the laundry and powder room. KI Commercial relished the opportunity to get involved in this project. 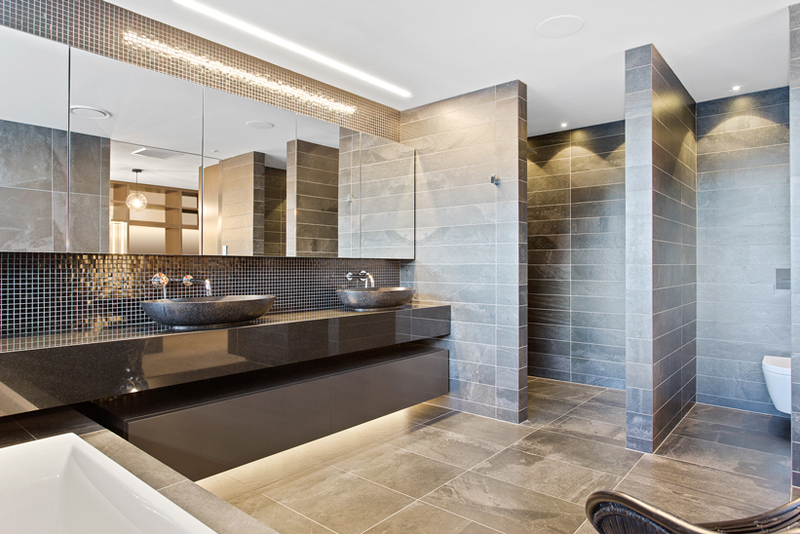 The highly-skilled team frequently take on residential renovations and new builds as well as commercial builds and fit-outs. With this house located in one of the best streets in Merivale, so close to the park, tennis court and a short walk to the mall, it takes pride of place in a prime spot. And now, with its transformation complete, here at Abode we think this well thought-out, meticulously finished, luxurious home is well deserving of the title of Best Renovation. Exquisite. Best Inner-city Dwelling goes to this striking pair of townhouses in the heart of the city, designed by Three Sixty Architecture and built by ZBUILT. well-weathered cliché but, in this case, it tells the story. This project proves that living in the thick of the action does not have to mean sacrificing privacy and secluded outdoor spaces, and we love it! Three Sixty Architecture designed what is actually a pair of buildings – unrestrained by recession planes between them – created in two quietly spectacular ‘pod-like’ forms, linked together by a glazed bridge. Inside the lofted interior spaces are open and light-filled, designed to capture the sun. The exterior is wrapped in black Colorsteel, with a longitudinal standing seam that gives the profile a sharp minimalist finish and dramatic shading effects, married with band-sawn vertical shiplap cedar. Outdoors there is everything you need with an entertaining area, stainless steel spillover spa and lap pool by Pioneer Pool and Building all with complete privacy from any of the neighbours. The plans originally included a water feature but late in the piece it was decided for the sake of another 800mm, they might as well have the pool and we bet that’s a decision the owners don’t regret. The company that made it all happen, architectural building company Zbuilt, specialises in high-end architectural and energy-efficient homes, managing director Joshua Smith says their wealth of experience in these specific areas delivered a pair of inner-city townhouses that offer exceptional style and energy efficiencies. Preparing the TC3 ground – which the owner described at the time as “a challenge” due to its proximity to the Avon River – required careful planning. To create a stable foundation, 12-metre-deep screw piles were capped and attached to a Muscle Slab system, and to maximise the thermal performance of the heated floor extra underfloor insulation was added. Working within the confines of a compact inner-city site provided its fair share of challenges. Joshua says the project required careful planning in terms of logistics and the management of the numerous subcontractors involved. We chose this project as best inner-city dwelling for its creative approach to the problems of space and privacy, the sensational street frontage and exterior lines, and the luxurious hotel-like feel of the elegant interiors. Stunning. Our Best Show Home goes to Dwell Homes' riverside beauty, a showcase of outstanding workmanship. Just as the last trace of builder’s dust was wiped away and towels were being carefully stacked in the brand spanking new bathroom, the Abode team arrived en masse to be one of the first to lay eyes on Dwell Homes’ shiny new showhome in the heart of Merivale – and we were impressed! Tucked away at the end of a long drive, the section was love at first sight for Bryan Doull of Dwell Homes and we could see why. Approaching the front of this slick looking home, with its contrasting wooden cladding and expanses of glass, you’d never know the house hides the sweetest surprise. Once inside, more generous windows reveal a beautiful meandering stretch of stream that forms the lush, curved boundary to this special site. The proximity to the water is wonderful, however, the TC3 status of the land posed some engineering challenges. The consent process took more than 11 months to finalise and the home is elevated by more than a metre to accommodate the TC3 site development requirements. Designed as three pavilions, linked by an expansive central hallway and a sheltered recessed courtyard, the cedar-clad home features the finest and most innovative building materials and finishes. The attention to detail from Bryan and partner Lena, who designed the interiors, is evident in every aspect of the generous 340 square metre home, comprising four bedrooms, large living rooms and a kitchen and dining area that is as impressive as it is spacious. We loved the way this home connects with the outdoors with wrap-around decking which gives access to the garden from every room. The carefully thought-out floorplan creates tranquil zones to savour the view from indoors and out. Lena’s eye for interior detailing and persistence in sourcing the very best fixtures and fittings really shines, and the result is a home that’s stylish, understated and has a distinct air of quality. Bryan, an architect with more than 30 years’ experience designing and delivering bespoke projects for clients, realised the potential this spectacular land package presented, “Dwell Homes specialises in sustainable architecture, using sustainable materials to build site-specific homes tailored to our clients. This site offered us a chance to show what we are capable of,” Bryan says. Here at Abode we think the decision this talented team made to pounce on this site and use it to inspire a showcase for their work was a master stroke. Superb!